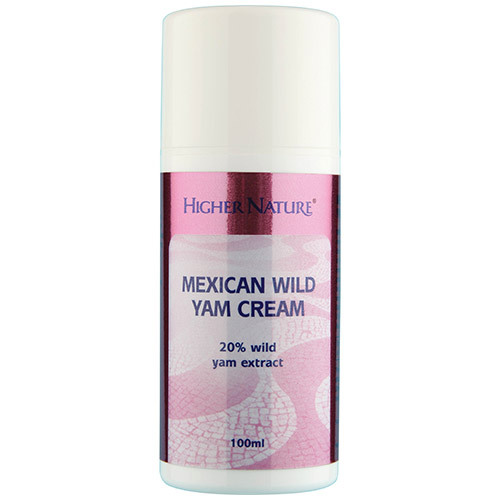 Mexican Wild Yam Cream is a rich body cream with a full 20% of wild Yam extract rich in diosgenin and phytosterols. Also provides Dong Quai, Black Cohosh and Agnus Castus. Not advisable if pregnant or breastfeeding. Contains nut oil. Suitable for Vegans. Product is Corn, Soya, Wheat and Gluten Free. Non-GM. aqua, Plant Extracts:dioscorea villosa root extract, alcohol, prunus amygdalus dulcis (sweet almond) oil, glyceryl stearate, cetearyl alcohol, ricinus communis seed oil, cetearyl alcohol, DL-alpha-tocopheryl acetate (vitamin E), Cimicifuga racemosa root extract, Vitex agnus castus extract, cetyl esters, glucose, angelica sinensis root, aloe barbadensis, disodium EDTA, lavandula angustifolia oil, linalool, glucose oxidase and lactoperoxidase, geranoil, limonene. This cream must be applied externally to the skin. If you use it in one spot the skin will not absorb as much over time, so it"s recommended to move the application area around the body. The inside of the thighs. For best results, begin at the top of the body (position 1) and continue downward on the body, each day increase the position number. Once you`ve applied to position 7, begin the following day back at the top, position 1 to repeat the cycle. Rub the lotion thoroughly into the body`s tissues until it is completely absorbed. This cream can also be applied to the outer vaginal area (dilute with V Gel or a simple cream). Below are reviews of Mexican Wild Yam Cream - 100ml by bodykind customers. If you have tried this product we'd love to hear what you think so please leave a review. This reduced my PMS greatly, particularly the cramps. Of the natural solutions I have tried, this has worked the best. Brilliant product! Almost immediately no hot sweats at night and only one a day! My migraines every 3 weeks have become much easier to manage too! This cream has worked miracles for me, after 2 applications and 8 weeks later I have not had the hot flushes that were ruining my days and nights...wonderful....ladies try it ..it works! I have been using this wonder cream for over 6 months now! I had started the menopause and was having dreadful hot flushes every 30 minutes or so and it was driving me crazy. I didn't want to go down the HRT route and found wild yam cream on this website. The hot flushes stopped after I had used the cream only twice and I have never had a problem since, unless I forget to put my cream on. It really is wonderful and smells nice too! I am recommending it to everyone I know! I've been using this cream for a few weeks now and it has definitely helped address some lubrication issues. So much so that I haven't needed to use the v gel I purchased the same day! I have been using the cream for 7 weeks & believe it is balancing out my moods but what has been amazing is that my bust have increased a cup size which is great news for someone who has been a B cup for the last 25yrs! So if your looking for an increase in bra size try this. Question about Mexican Wild Yam Cream - 100ml Can the diosgenin in this product cause breast cancer? I am confused by Diosgenin and Progesterone. Progesterone is a principal female reproductive hormone which naturally balances estrogen, the second major female hormone. Many women have excess estrogen, which increases the risk of breast cancer, cancer of the uterus and osteoporosis. Excess estrogen can also severely worsen premenstrual syndrome (PMS). To balance progesterone/estrogen levels, many doctors prescribe synthetic progesterone, progestin, which has recognised side effects. Natural progesterone's side effects are minimal. Most natural progesterone is made from diosgenin, a plant sterol abundant in the Mexican yam (Dioscorea villosa). Manufacturers convert diosgenin to the identical progesterone molecule that the body produces. Therefore, progesterone is natural. It is not a synthetic substance. 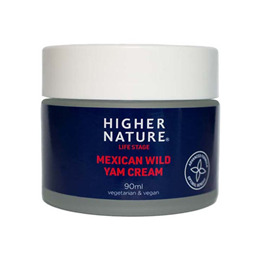 Question about Mexican Wild Yam Cream - 100ml What percentage of wild yam does the cream contain? Our Mexican Wild Yam Cream contains 20% premium grade Mexican Wild Yam. Mexican Wild Yam cream is a rich body cream with a full 20% of wild yam. Also provides Dong Quai, Black Cohosh and Agnus Castus.